Established in 1943, Fine Tubes Ltd manufactures seamless and welded tubes in a wide range of stainless steel, nickel, titanium and zirconium alloys in straight lengths or coil forms. These high specification special alloy tubes are used within demanding industrial applications across the globe, with principle markets including oil and gas, aerospace, medical and power. Fine Tubes Ltd employs 336 permanent members of staff, with the manufacturing side of the business based at its Plymouth site and sales offices in the UK, Germany, France and India. Having previously worked with the University, Fine Tubes Ltd were keen to build upon existing relationships and were awarded Enterprise Vouchers to facilitate this. The vouchers were used to access the facilities of the Electron Microscopy Centre in order to understand the process metallurgy of materials, to compare different materials and their performance using advanced techniques like scanning electron microscopy to investigate compositional analysis of welded products and compare with non-welded products. 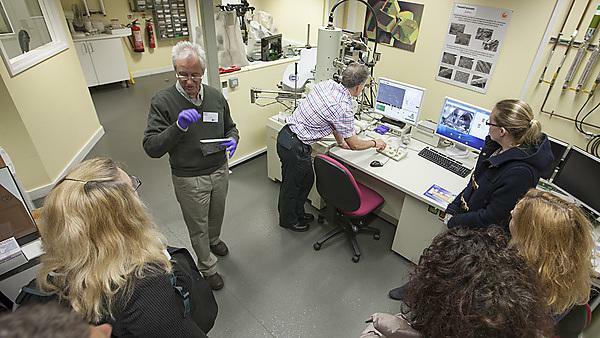 Plymouth University’s Electron Microscopy Centre provides expert support and access to a wide range of microscopy solutions, supporting a broad user group that spans manufacturing, engineering, textiles, electronics, biomedical and other sectors. Visit the Fine Tubes website. Fine Tubes are passionate about manufacturing some of the best precision tubes in the world, and our experience has made us a leader in the field.